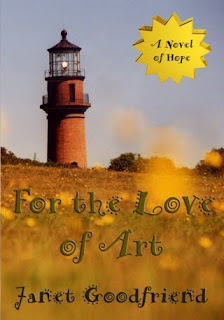 Come meet Upton author Janet Goodfriend on March 17 from 6:00-8:00 pm at the Upton Town Library where she will chat about her debut novel, For the Love of Art. Make a personal connection with our writer of your next book as she signs your very own copy. This literary treat is about a friends’ getaway on Martha’s Vineyard, turned art heist puzzle, turned school district conundrum winding readers through a tale among artists with their misplaced and rediscovered priorities. Though themes surrounding family, public education, environment, and support for the arts emerge, uniquely challenged characters often propel the story into audible bursts of laughter. The book price is $17 and is also available for $9.99 on Kindle. Visit www.janetgoodfriend.com for more information.